Exercise bikes are fast becoming the most popular home fitness equipment. They allow for high cardio and resistance workouts, that burn lots of calories. They are low impact on your knees and the back, are easy to store and are one of the safest workout options. Choosing the right model for you depends on your space requirements, your fitness needs and the types of workouts you plan to do. There are so many to choose from, and finding time to workout is hard enough without you having to search the web for the best options! To help with your decision, we have put together this shopping guide to make your choice easy and save you time. Upright Exercise Bikes: These are the closest to riding a traditional bike. The hand positioning is in the front and the pedals are underneath the body. 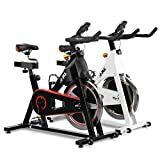 With much less stress on the joints than other types of exercise, these bike are a much safer cardio workout and offer a great exercise solution that is not weather dependent. If you are looking for the benefits of cycling, without having to leave home, then this is the bike for you. Recumbent Exercise Bikes: These offer a wider seat than upright bikes. The back is fully supported by the seat and pedals are designed to take all the pressure off your back. These are fantastic bikes for people who have back problems, arthritis or orthopaedic conditions, or for people who need something with less impact on the knees and other joints who would otherwise find it difficult to exercise. Spinning Bikes: These are designed to feel like a road racing bike. With the higher seat positioning, lower handlebars and the support of many riding potions, this model offers an authentic riding experience. 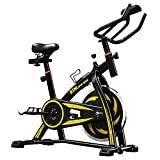 This is a professional exercise bike, aimed at serious bikers for intense workouts and training. If you are passionate about biking, this bike is for you! Dual-Action Exercise Bikes: Dual-action exercise bikes work a lot of muscle groups at once. Their handlebars move in sync with the pedals, a concept similar to elliptical trainers. Features include built-in cooling systems and resistance levels, of pedals and handlebars, that can be independently adjusted. Quiet operation: Finding an exercise bike that is as quiet as they need it to be improves satisfaction and gets rated higher by consumers. Home workouts offer a convenient solution for being able workout in the comfort of your home. A quieter bike means you can listen to your workout playlist without distraction and are able to have your bike in shared family space. Easy to assemble: Getting a bike that is easy to assemble, disassemble and store is a big plus for new exercise bike owners. This means you can move your bike easily, put it together without help or pack it away when holiday guests come to town, which will make you much happier with your purchase. 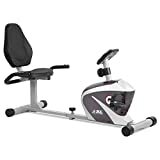 Features: Modern exercise bikes have a variety of features, including workout programs, heart rate monitoring, and LED screens. Unhappy reviewers feel their bikes don’t have the features they need. Happy riders, however, have features that match their fitness goals. Think about what you want to achieve and there will be a bike with the features that match it. Storage: If you have very little storage space and need to put your bike away regularly, then you will be satisfied with a lightweight foldable model. If you have more space, and won’t be moving it around as much, then choosing a more solid bike, with more features and options, will be the way to go for you. 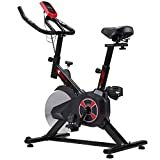 Choosing an exercise bike that tracks distance, speed, calories and has a built in heart rate monitor will help you track your progress and reach your training goals. There are some great value for money exercise bikes that offer all of these features. It is important to determine how much space you have for your new equipment. Measure the space where your new bike will be standing and also consider the height. Upright bikes have a shorter length but can have a height of up to12 inches! Some bikes, especially air resistance bikes, can be a little noisy. Take into consideration where your bike will be placed and what your sound needs are, before choosing your bike. This will ensure that you are not inconveniencing family and can workout anywhere, hassle free. The weight of your exercise bike is also important when thinking about storage. 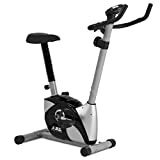 If you are going to be moving your exercise bike around, perhaps outside in the summer or from room to room, then you will need a bike that is light enough for you to move around with ease. Even the most cost effective bike should have these minimum features: quiet handling, resistance and a few programming options. Make sure the exercise bike you’re buying has at least a one-year warranty. For added peace of mind and convenience, check if the bike has a labor warranty, which could possibly cover a home service technician, should something goes wrong or you require assistance. Riding comfort is key. To make your longer workouts more enjoyable, look for something with a comfortable, adjustable seat. Adjustable settings also mean that the bike can be used by different family members and adapted for their workout needs too. Making it possible for your whole family to keep fit! 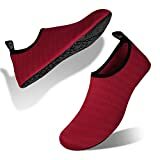 Sunny Health & Fitness: In business for over 10 years and headquartered in Los Angeles, California, Sunny Health & Fitness carries the finest exercise and health equipment from top manufacturers in Taiwan and China. Schwinn: Schwinn® created in Chicago by Ignaz Schwinn and partner Adolph Arnold incorporate "Arnold, Schwinn & Company" on October 22, 1895 and are known for good quality exercise equipment. Exerpeutic Fitness: Exerpeutic products were introduced to the US market in 2007. Since then, their exercise equipment has become widely accepted by thousands of customers due to the high quality they provide. Sole: SOLE has been providing quality exercise equipment to North America for decades.